When looking for comics to read, I prefer to purchase trade paperbacks versus single-comic issues. I find there are so many comics to enjoy that I tend to fall behind in my favorite series. When I purchased Midnight Task Force from Mad Cave Studios I fell back on my ways and purchased the whole volume instead of just the first issue. The premise seemed exactly up my alley and I figured I would enjoy the complete story. Midnight Task Force is honestly one of my favorite comic series I read this year and I’m anxiously awaiting the release of the next issues. It’s 2055 in Detroit, crime is abundant, and the police force is poisoned by corruption and bribery. Aidan McCormick is a war-torn PTSD survivor recruited by the Detroit police to solve violent crimes. The serial killer only known as “The Flayer” has been killing seemingly random citizens in downtown Detroit. Aidan is sent to investigate and aid the police in putting an end to the violence. As Aidan becomes involved in the investigation, he finds his schizophrenia worsens. Can Aidan solve the case while keeping his sanity intact? After reading this first volume, I found similarities with Aidan McCormick and John Wick—they both have long, dark hair, and both use violence to bring means to an end. Although Aidan does have his cybernetic arm, which would make John Wick that much cooler. Writer Mark London (who I wrote about in a previous article about Mad Cave Studios) tells a compelling story, but the artwork is one of the comic’s biggest strengths, at once bright and gritty. Downtown Detroit is brightly lit, with neon skyscrapers and luminescent reflections off of fancy cars. This contrasts with the dark shadows lining the night sky and narrow alleyways. Alejandro Giraldo is the illustrator behind Midnight Task Force, and before becoming the lead artist for Mad Cave Studios, designed covers for comics in Bogotá, Columbia. Giraldo does have his art posted on his Art Station Page, where he posts artwork other than his designs for Midnight Task Force. The dark aesthetic does make reading Midnight Task Force difficult without proper lighting. I was reading Midnight Task Force in my bedroom with my night light turned on and I did have to squint to see some of the panels. This is a rather minor inconvenience, but one I felt worth mentioning. Aside from the darkness of the panels, I felt a certain sequence toward the end of Midnight Task Force was rather underwhelming. I’m trying not to give away spoilers, but there is an invasion in the last issue where the characters have to fight off an array of enemies. My minor grievance with this section is that I felt the characters weren’t given a chance to highlight their strengths. It felt very fast-paced and many of the characters were forced to flee instead of fighting their way out of the situation. I’m hopeful that the next volumes in the series will feature more action between the characters and the upcoming enemies. Midnight Task Force did not disappoint. The story was enthralling, the artwork was fabulous, and despite the action sequence toward the end, I’m still invested in the series. Since Mad Cave Studios is an indie publisher, they need support from comic fans to keep putting out creative stories. Talking to local comic book stores about ordering Mad Cave Comics will help promote this series. 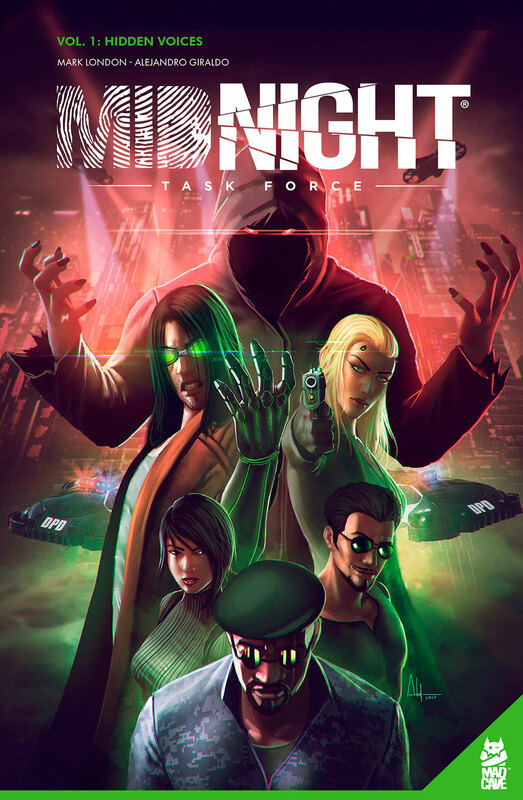 Midnight Task Force can be purchased on comiXology and Mad Cave Studios can be found on Facebook, Twitter and Instagram.